an openness to collaborate with other Infant & Toddler teachers. Mission: We are a community of learners working together to provide a Montessori education experience that engages and inspires students to become life-long learners and responsible participants in our diverse global community. Brickton Montessori is an independent non-profit school. 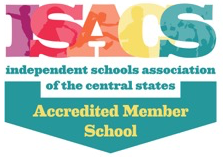 We are accredited by the American Montessori Society (AMS), the Independent Schools Association of the Central States (ISACS), and the Lake Michigan Association of Independent Schools (LMAIS). Brickton is a recognized school by the Illinois State Board of Education (ISBE) and licensed by the Department of Children and Family Services (DCFS). Brickton Montessori School does not discriminate in their educational programs, hiring, or activities on the basis of race, color, ethnicity, sexual identity, age, religion, or ability or any other characteristic protected under applicable federal, state or local law.